Oceans have taken up about one-third of the anthropogenic carbon dioxide (CO2) produced in the past 200 years (Sabine et al., 2004). Continued emissions of this gas are causing acidification of sea water (Caldeira and Wickett, 2003) which is a significant driver of change in marine biological systems (Lovejoy and Hannah, 2005). The reaction of CO2with seawater increases the acidity and reduces the availability of carbonate ions that are necessary for marine calcifying organisms such as crustaceans, echinoderms, mollusks and corals to build their calcium carbonate shells and skeleton (Cooley and Doney, 2009). This will have serious implications for marine biodiversity and fisheries. There is a paucity of empirical data on specific effects of acidification on marine life. This study is a follow-up of the recent publication of the work carried out at this institute (Mustafa et al., 2013) on coral reef tiger grouper (Epinephelus fuscoguttatus). This study was conducted to investigate the effect of exposure of white shrimp, Litopenaeus vannamei, to acidified sea water on chitin concentration in the exoskeleton. The authors would like to emphasize that this was a simulated experiment which involved induced acidification of seawater drawn in tanks. It is a preliminary study, perhaps first of its kind focussing on chitin which is the main component of the shrimp exoskeleton. The shell performs multiple functions: supporting the body, resisting mechanical loads, providing environmental protection and resistance to desiccation (Chen et al., 2008). Chitin is a long-chain polymer (C8H13O5N)n of N-acetylglucosamine, a modified polysaccharide that contains nitrogen. It is synthesized from 2-(acetylamino)-2-deoxy-Dglucose. These units form covalent-1,4 linkages similar to the linkages between glucose units forming cellulose. Due to chitin and heavy mineralization, typically calcium carbonate, the exoskeleton of shrimp is such a rigid structure that it has a very limited capacity to keep pace with growth of the body. To grow and develop, shrimp has to periodically replace its old exoskeleton through molting and replace it with a new one which is larger and heavier. For this purpose, shrimp produces chitin synthetases and chitinolytic enzymes. Enzymes play a key role in coordinating the chitin synthesis and its degradation (Merzendorfer and Zimoch, 2003). For these reasons, studies on the effect of ocean acidification on chitin assume importance. L. vannamei is an important part of the crustacean community, contributes to the food chain in the ocean and supports commercially important capture fisheries. Due to its fast growth and resilience, L. vannamei is also increasingly used in mariculture. Furthermore, since chitin is also used for industrial and medicinal purposes, and in biomedical research, such studies assume additional importance. Specimens of the white shrimp were obtained from the shrimp hatchery at Borneo Marine Research Institute of Universiti Malaysia Sabah. Their average length and body weight were 10.8 ± 0.16 cm and 7.57 ± 0.3 g, respectively. The test specimens were acclimated to tank conditions for a week. Shrimp specimens drawn randomly from the acclimatization chambers were given two different treatments: Treatment- A was control set where normal conditions (pH=8, no exogenous CO2 supply) and Treatment-B where CO2 was introduced till the seawater pH declined to 7.5. Three replicates were run, each comprising 150 shrimp. Volume of tanks was 200 liters. Water quality was maintained and pH was stabilized by additional supply of CO2 as and when necessary. Throughout the experiment, bottom cleaning was done on a routine basis. As much as 80% of the seawater was renewed daily. The CO2 cylinder was attached to a pipe equipped with a manual regulator. Temperature, salinity and dissolved oxygen of the water were 24-26oC, 28-30 ppt and 6-6.5 mg L-1. These measurements were taken using the multi-parameter probe (HANNA HI9828). During this period, the shrimp was offered commercial pellet to satiation level. After four weeks of trial, the shells (exoskeletons) of the shrimp were removed, washed with water and soaked on a blotting paper to remove moisture. Measured samples of the shell were processed according to the method adapted from Pinelli et al. (1998) for extraction of chitin. The method involved removal of shells, their washing with potable water, boiling in 3% sodium hydroxide solution for 15 minutes followed by cooling to room temperature. The contents were centrifuged at 3,000 rpm for 30 minutes. Supernatant was drained out to remove protein extracted in the sodium hydroxide. Residue was boiled again in the 3% sodium hydroxide solution to repeat the process that consisted of decanting the supernatant and retaining residue. The latter was washed with distilled water repeatedly. Thereafter, the residue was suspended in acetone and centrifuged at 3,000 rpm for 15 minutes to bring out pigments and lipid fractions and other acetone-soluble materials in the supernatant which was disposed. Following 30-minute treatment of the residue with sodium dilute hypochloride solution and washing the tissue sediment with distilled water, the contents were treated with 0.1% hydrochloric acid at room temperature for 2hours. The contents were centrifuged for 30 minutes at 3,000 rpm, and the supernatant was removed. The residue was washed with distilled water and air dried. The dry product was subjected to grinding to yield powdered chitin. Acidification of seawater significantly reduced (P<005) the chitin concentration in the exoskeleton of the shrimp (Figure 1). While it is expected that the shell will erode under high CO2 and consequently acidic conditions of seawater (Madin, 2010), and the shrimp would need to continue to build new skeleton. However, the formation of new shell is hindered by the inhibition of Y-gland activity caused by change in the carbonate chemistry as reflected by decline in pH of the sea water. While it might appear that Y-organ could step up production of MIH to inhibit the molting process, but since acidification of seawater causes acidosis inside the body which without a doubt disturbs the homoeostasis, it seems quite a remote possibility that acidification would stimulate X-gland while inhibiting Y-organ. Disruption of the functional roles of both the glands is a more plausible explanation. Molting is a complex process which is triggered by ecdysteroid secreted by a pair of Y-organs. Y-organ activity is reported to be negatively regulated by a neuropeptide known as molt-inhibitory hormone (MIH) produced by X-organ sinus gland system located in the eyestalk. The available evidence suggests that addition of X-organ sinus glad or purified MIH inhibits ecdysteroid secretion from Y-organ (Mattson and Spaziani, 1985; Soumoff and O’Connor, 1982; Webster, 1986). We believe that acidification interferes with the formation or activity of either the synthetase and chitinolytic enzymes or hormone production by the Y-gland or both occurring simultaneously. It could be that acidosis disrupts the regulatory mechanisms involved in synthesis of chitin at molecular level which manifests in a progressive degradation of this polysaccharide. Shrimp extracts calcium ions (Ca2+) and carbonate ions (CO32-) from seawater and their combination into calcium carbonate (CaCO3) contributes to shell formation. However, hydrogen ions (H+) tend to form bonds with negatively charged carbonate ions. When this happens on a large scale as a result of acidification of seawater, fewer carbonate ions are available for shrimp to build their shell. Unless shrimps have a mechanism to actively pump out H+, while retaining calcium and carbonate ions, the shell formation will be affected. This mechanism is a sort of active transport where ions are moved against concentration gradient at the expense of metabolic energy. Till date there is no firm evidence to suggest existence of such a mechanism in shrimp. It is unclear if shrimp will evolve such a mechanism to adapt to adaptation to sea water. 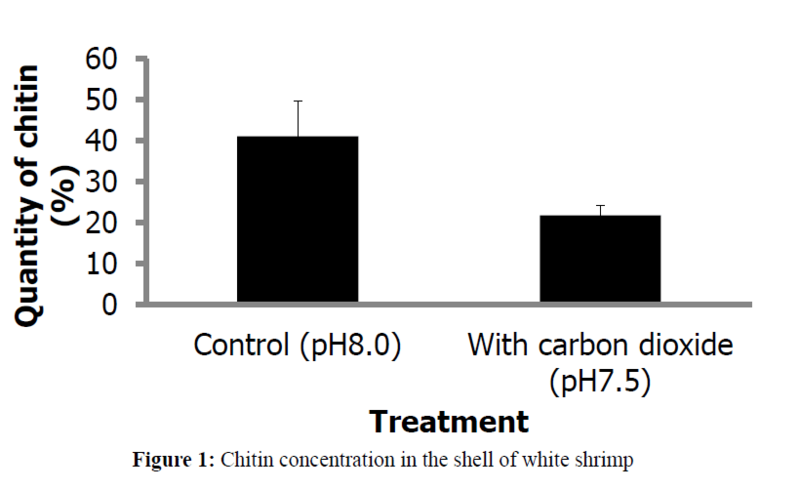 Chitin extracted from the shells of shrimp in control and treated groups significant differences, suggesting that exposure to lower pH erodes the chitin, obviously changing the chemical composition and weakening it. What other chemical undergo changes as a result is not clear but it is certainly a topic of interest. The amount difference in the chitin of the two treatment sets is significant and could not be linked to just erosional effect of acidified water which is just 0.5 pH unit lower than the control set pH. Decline in chitin biosynthesis as well as interference with molting process are the other factors that could contribute to this difference. Exoskeleton takes time to strengthen its chitin concentration, with newly formed shell expected to have lower concentration compared to older shell. Differences in molting that acidification apparently causes could be a significant factor contributing to this difference in the concentration. It will become more explicit if chitin content in the whole exoskeleton of individual specimens of shrimp is determined and compared. Results of this trial also point out the differences in chitin concentration of the two sets despite lack of significant difference in size. Possibly, the white shrimp uses less energy for maintenance of internal acid-base balance or in the mineralization of calcified exoskeleton that allows it to grow unlike lobster larvae that employ far more energy to power proton pumps for maintenance of calcified structures in acidified water (Portner et al., 2004), reducing investment of substantial amount of energy in growth and energy-consuming molting process. These studies suggest differences in the response of different species to the ocean acidification. Lovejoy, T.E. and Hannah, L., (eds.) (2005). Climate Change and Biodiversity. Yale University Press, New Heaven and London. Madin, K., (2010). Ocean acidification: A risky shell game, Oceanus Magazine, Woods Hole Oceanographic Institution, MA, USA. Mattson, M.P., Spaziani, E., (1985). 5-Hydroxytryptamine mediates release of molt-inhibiting hormone activity from isolated crab eyestalk ganglia. Biological Bulletin 169: 246- 255. Merzendorfer, H., Zimoch, L., (2003). Chitin metabolism in insects: structure, function and regulation of chitin syntheses and chitinases. Journal of Experimental Biology 206: 4393- 4412. Mustafa, S., Senoo, S., Luin, M., (2013). Response of pure stock of coral reef tiger grouper and hybrid grouper to simulated ocean acidification. International Journal of Climate Change Impacts and Responses 5: 47-54. Pinelli, S.A., Teledo, G.A.R., Esquerra, B.I.R., Luviano, S.A.R., Higuera, C.I., (1998). Methods for extracting chitin from shrimp shell waste. Archivos Latinoamericanos de Nutricion 48: 58-61. Portner, H.O., Langenbuch, M., Reipschlager, A., (2004). Biological impact of elevated ocean CO2 concentrations: lessons from animal physiology and earth history. Journal of Oceanography 60: 705-718. Sabine, C.L., Feely, R.A., Gruber, N., Key, R.M., Lee, K., Bullister, J.L., Wanninkhof, R., Wong, C.L., Wallace, D.W.R., Tilbrook, B., Millero, F.J., Peng, T. H., Kozyr, A., Ono, T., Rios, A.F., (2004). The oceanic sink for anthropogenic CO2. Science 305: 367-371. 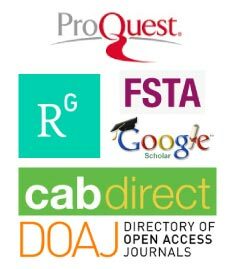 Soumoff, S., O’Connor, J.D., (1982). Repression of Y-organ secretory activity by molt-inhibiting hormone in the crab, Pachygrapsus crassipes. General and Comparative Endocrinology 48: 432-439. Wesbster, S.G., (1986). Neurohormonal control of ecdysteroid biosynthesis by Carcinus maenas Y-organ in vitro, and preliminary characterization of the putative moult-inhibiting hormone (MIH). General and Comparative Endocrinology 61: 237-247.